The Ameraucana is an American made bird that lays blue eggs of various shades. It was developed from the Chilean Araucana breed with the intent to get rid of the lethal allele combination. Size: Standard Male: 6.5 Ibs. / Standard Female: 5.5 Ibs. Bantam Male: 30 oz. / Bantam Female: 26 oz. Comb, Wattles & Earlobes: Pea comb with small or absent wattles and small round earlobes. All are red. Color: Eyes are reddish brown and the beak is horn to dark horn unless otherwise noted. Shanks are slate colored and bottoms of feet and toes are white, unless noted otherwise. Black: Standard black plumage, including beard and muffs, black beak, with shanks being dark slate to black. Bottoms of feet and toes are still white. Blue Wheaten: Male: Plumage is predominately blue (ranging from dark blue to bluish gray) highlighted with striking orange contrasts, including light orange on head and back of neck, bright reddish orange on back, golden orange on saddle, and orange stripe on bow of wings. Female: Plumage is highlighted by wheaten shades (tans to golden yellows) with hints of light blue on tail and wings and very light grayish blue beard and muffs. Brown Red: Standard brown-red plumage. Silver: Standard silver plumage. Male: black beard and muffs. Female: Light gray beard and muffs, salmon at lower extremity of beard. White: Standard white plumage. Light horn beak. Special Qualities: Lays blue eggs that vary in shades of blue. 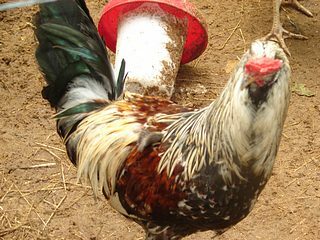 The modern breed of the Ameraucana was developed in the United States in the 1970's. Breeders began developing this bird to gain a bird that laid colored eggs that did not have the lethal allele combination trait that the Araucana birds have. 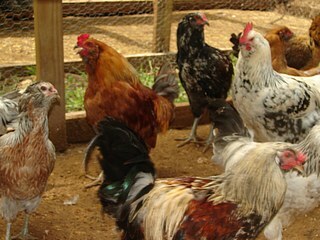 The breed has good looking birds that have a medium length tail, muffs, and a relatively small pea comb. They do have a somewhat stocky build and large eyes. These birds are good egg layers and can usually have an impressively long laying season without the need to use artificial light to keep the birds laying year round. They are also a quite hardy and active breed with a good temperament. They were first admitted into the APA in 1984.